This may be a trivial question, but I can't seem to find a concise answer on how to appropriately name (and what dimensions to use) for the iOS launch icons? 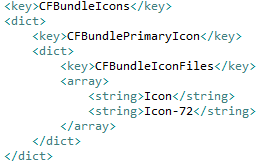 So basically, what launch icon files are wrong and/or are missing? If I add more launch icon images, would I need to change anything here? As far as I can tell, there are no corresponding Plist entries needed for these. They follow the format Icon-"size". 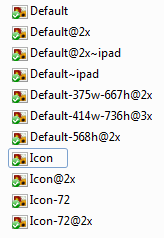 There is now a dedicated wiki page to how to define your icon when you submit your app for iOS. Launch image or launch xib / storyboard?